Jeremy Irons and Lesley Manville star in Eugene O’Neill’s prize-winning masterpiece! Jeremy Irons and Lesley Manville come to Wyndham's Theatre for a strictly limited 10 week run of Eugene O'Neill's Long Day’s Journey Into Night tickets available now! One of the UK’s leading and critically acclaimed actors, Academy, Golden Globe and Tony Award-winner, Jeremy Irons returns to the London stage for the first time in over ten years. He is joined by BAFTA and Olivier Award winner Lesley Manville, one of Britain’s most respected actresses, who is reunited with director Richard Eyre following their critically acclaimed, sold-out production of Ibsen’s Ghosts. 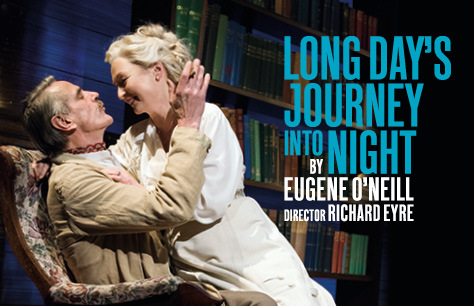 Book your Long Day’s Journey Into Night tickets now while you still can! Thoroughly enjoyed play. Unfortunately my friend was to come at last minute for health reasons, and I was unable to return spare ticket. £120 was lost and wasted. Excellent performances by Jeremy Irons and Lesley Manville. Lesley was superb as the addicted, agitated and nervous wife. Would recommend, hope she wins a BAFTA!